The SAC Aerospace Museum Education Department offers field trips for grades K-12 based off of The Nebraska College and Career Ready Standards for Science. With our customizable cross-curricular field trips, there is programming to satisfy a large number of learning goals. Our field trip offerings are in robotics, engineering, aviation, space, and history. The field trips vary from 2 to 4 hours depending on your selection of activities. Select a Mission for Your Students! Our field trip options are listed below. Contact our Education Manager to arrange your trip. You can reach us by calling 402-944-3100 ext. 204, or emailing the Education Department. Our staffing ratio is one Museum Educator per 30 students that attend the field trip. Schools must schedule a field trip at least two weeks in advance. A minimum number of 10 students is required. Late Arrival Policy | Your school field trip reserves time with our Education Staff, with this in consideration, we cannot guarantee staff or content for late arrivals. A 15 minute grace period will be observed. We recommend arriving 15 minutes prior to the beginning of your field trip to check-in, pay, and use the facilities. Pricing | $7.00 per student, $7.00 per teacher (1 free teacher for every 10 students), and $7.00 per chaperone. Please let us know if the school will be paying for the chaperones or if they are responsible for their own admission to the Museum. Payment | Payment can be processed via credit card, cash or check. Full payment will be collected on the day of your field trip. No refunds for weather or special circumstances; we will instead reschedule your field trip for another date. Payment is required for the number of students confirmed at the time of your confirmation call with our staff, not the time of attendance. Staying for lunch? Students are welcome to eat their sack lunch at our designated cafeteria located under the massive wingspan of the B-36 in Hangar A. Lunch is not provided by the Museum. If you need to purchase box lunches, please contact the Education Manager at 402-944-3100 ext. 204, or by email. Questions? Contact staff by calling 402-944-3100 ext. 204, or emailing the Education Department. Click on the name of any field trip activity below to read a short description, as well as, the educational standards it fulfills. Air Powered Rockets: Rockets are a fun staple at our museum. Students have the opportunity to build an air powered paper rocket capable of hitting the ceiling of our museum and beyond. Using their strength and determination, students will pump to build up air pressure inside of our launchers until their rocket shoots for the sky! SC.4.4.2.A: Use evidence to construct an explanation relating the speed of an object to the energy of that object. Alka-Seltzer Rockets: This project will introduce students to the concepts of pressure, gravity and Newton’s Three Laws of Motion. Students will launch a rocket by releasing energy in the form of CO2. Astro Challenge: Scientists are on a quest to learn about space, our solar system, and beyond. Students will experience how astronauts may collect space samples from the moon, mars, and other celestial bodies. These samples help scientists study the climate and geology from where the samples were collected. Astronauts face dangers and challenges of exploration in space. Students will work together to collect space samples, place them in the cargo hold, and learn how astronauts solve the daily problems of travel in space. B-17 Experience: Students will learn about the strategic bombing campaign and the role that the B-17 played in making it successful. Students will, also, play out a historical bombing mission in our “B-17: The Experience” simulation designed by education staff. SS 12.4.2 (US): Students will analyze and evaluate the impact of people, events, ideas, and symbols upon US history using multiple types of sources. SS 12.4.4 (US): Students will identify and evaluate the effects of past, current, and potential future events, issues, and problems. Bloxels Advanced: Students will explore level development and game-play by using interactive app. Students will be able to explore how to create their own game levels, character creation, and animation. SC.3.7.2.E Generate and compare multiple possible solutions to a problem based on how well each is likely to meet the criteria and constraints of the problem. SC.4.4.2.E Plan and carry out fair tests in which variables are controlled and failure points are considered to identify aspects of a model or prototype that can be improved. SC.8.1.1.B Develop a model to generate data for iterative testing and modification of a proposed object, tool, or process such that an optimal design can be achieved. Bloxels Basic: Students will explore level development and game-play by using interactive app. Students will be able to explore how to create their own game levels. Roller Coaster Design: Students will investigate the properties of potential and kinetic energy with this roller coaster motion experiment. Given parts of a roller coaster track, students will design and construct two different tracks, hypothesize to outcome with different weighted objects, record and synthesize their results. SC.5.11.3.A: Support an argument that the gravitational force exerted by Earth on objects is directed down. SC.8.4.3.B: Develop a model to describe that when the arrangement of objects interacting at a distance changes, then different amounts of potential energy are stored in the system. HS.4.4.C: Design, build, and refine a device that works within given constraints to convert one form of energy into another form of energy. Constellations Planetarium Show: The Constellation Planetarium Show allows students to view the stars that can be currently found in their night sky, as well as some planets and comets. Cuban Missile Crisis: Students will learn about the events leading up to the Cuban Missile Crisis. From there, students will be split into three groups and simulate the Cuban Missile Crisis from the perspectives of the United States, the Soviet Union, and Cuba. Students, within the groups, will take on the role of individuals involved in the crisis and experience some of the tough decisions made by making their own choices in how to respond to the other teams. Cubelets Advanced: Students will learn how much robots have in common with humans and build their own simple robots using the concepts of modular robotics to complete more advanced challenges. SC.4.6.3.C: Use a model to describe that animals receive different types of information through their senses, process the information in their brain, and respond to the information. Cubelets Basic: Students will learn how much robots have in common with humans and build their own simple robots using the concepts of modular robotics. SC.2.3.1.D: Make observations to construct an evidence-based account of how an object made of a small set of pieces can be disassembled and made into a new object. Cutthroat Space Race: Students will work in a group to build a lunar lander that will be used to land on the moon in a race against other groups. Just like the real Space Race, students will have have a limited budget for which to buy materials, and use those materials wisely in order to build a lander that can keep two astronauts safe. Students will also have opportunities to bid on “Sabotage Event Cards”, based on events from the Space Race which will grant their group an immediate special effect that can help them or hinder other groups. Whichever group can drop their lander from the highest height, possible, and keep their astronauts safe wins! Earth, Moon and Sun Planetarium Show: Through this planetarium show, we explore the relationship between Earth, Moon and Sun and how they work together as a system. Myths and misconceptions are dispelled with help of a cartoon coyote. How the Sun rises and sets is examined as well as some facts about the Moon such as orbits, craters, phases and eclipses. SC.1.11.3.A: Use observations of the sun, moon, and stars to describe patterns that can be predicted. Space Junk Collector: Students will make a International Space Station robot End Effector, and use it to pick up various objects to understand designing a tool to meet a specific need. Four Forces of Flight: Students will work in groups to scan planes in our museum by using an app we have on our tablets. Once they have scanned as many planes as they are directed to, they create and test a new plane against the Four Forces of Flight. SC.3.1.1.A: Plan and conduct an investigation to provide evidence of the effects of balanced and unbalanced forces on the motion of an object. FPG9s: Students will build a glider using an outline, a foam plate, penny, and tape. This project will explain the four forces of flight and the use of a rudder and flaps. SC.4.4.2.E: Plan and carry out fair tests in which variables are controlled and failure points are considered to identify aspects of a model or prototype that can be improved. Gravity Well: Gravity is the fundamental law of attraction in the universe. An educator will demonstrate how gravity and space time work by visualizing the concepts using the gravity well. Students will then have the opportunity to roll objects into the well themselves, creating a satisfying vortex and reiterating core concepts. SC.8.1.1.E: Construct and present arguments using evidence to support the claim that gravitational interactions are attractive and depend on the masses of interacting objects. SC.8.11.6.B: Develop and use a model to describe the role of gravity in the motions within the galaxy and the solar system. Hangar Tours: Students will get the chance to learn and ask questions about the historical aircraft in the Museum. Museum staff will take groups through the specific aircraft in each hangar, and discuss World War II, the Cold War, and the significant roles these aircraft played during this time period. Information given on tours is personalized to specific grade levels. LEGO EV3 Basic: Students will focus in on programming for this robotic activity. They will learn the basics of the Lego Mindstorms programming software and see their work come to life with one of our pre-built EV3 rovers. SC.6.6.2.D: Gather and synthesize information that sensory receptors respond to stimuli by sending messages to the brain for immediate behavior or storage as memories. LEGO EV3 Challenge: Students will have the opportunity to design and build a robotic creature and experience the process of engineering with a specific ask in mind. They will learn beginner’s programming to control their creature. LEGO EV3 Advanced: Students will focus in on programming sensors for this hour long activity. They will learn the basics of the sensor programming software and see their work come to life with one of our pre-built EV3 rovers. Little Bits Basic: Students will work in a group to explore circuitry using the Little Bits. Students will complete a series of challenges using the Little Bits to gain an understanding of circuits and how different “bits” can come together for a specific outcome. This will require critical thinking skills, creativity and cooperation between the groupmates. Little Bits Advanced: Students will work in groups to complete engineering design challenges using littleBits magnetic modular parts. Lunar Lander: Students will design a moon lander to land safely on the moon. With limited supplies, students will be challenged to keep their astronauts in their command capsule as their lander is dropped from increasing heights. SC.8.1.1.A: Apply Newton's Third Law to design a solution to a problem involving the motion of two colliding objects. SC.7.5.2.D: Analyze data from tests to determine similarities and differences among several design solutions to identify the best characteristics of each that can be combined into a new solution to better meet the criteria for success. SC.8.1.1.B: Develop a model to generate data for iterative testing and modification of a proposed object, tool, or process such that an optimal design can be achieved. HS.1.1.C: Apply science and engineering ideas to design, evaluate, and refine a device that minimizes the force on a macroscopic object during a collision. Magnastix Design: Students will learn about the attraction of magnets through the construction of Magnastix. These kits will provide students the opportunity to design a structure that uses the properties of magnets to keep a structure upright. In addition, students will be challenged to create the tallest freestanding structure. SC.3.1.1.D: Define a simple design problem that can be solved by applying scientific ideas about magnets. Examples of problems include constructing a latch to keep a door shut and creating a device to keep two moving objects from touching each other. Makey-Makey Advanced: Students, familiar with circuits or Makey Makey, will construct a game controller that must be ergonomically functional for a computer-based game. Students will experiment with different conductors to discover which objects are best suited for their game controller, exploring real world design challenges in ergonomic design. SC.2.3.1.B: Analyze data obtained from testing different materials to determine which materials have the properties that are best suited for an intended purpose. SC.4.4.2.B: Make observations to provide evidence that energy can be transferred from place to place by sound, light, heat, and electrical currents. 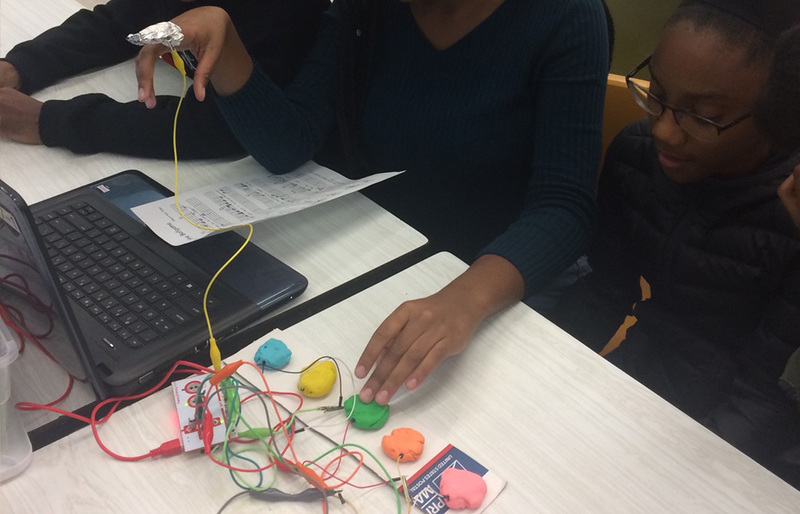 Makey Makey Basic: This fun packed activity connects handmade circuity to the computer by allowing students to wire balls of play-doh to function as a piano when touched. Students will make connections to complete their circuit to see an example of using circuitry in a real world function. Students will gain knowledge about parallel circuits, grounds, and contact points as well as integrating the lesson with technology. SC.2.3.1.B Analyze data obtained from testing different materials to determine which materials have the properties that are best suited for an intended purpose. SC.4.4.2.B Make observations to provide evidence that energy can be transferred from place to place by sound, light, heat, and electrical currents. Pack the Plane: Students will learn about the Doolittle Raid and the planning that went into making sure it succeeded using a simple math worksheet to calculate distance and weight of the aircraft. SS 8.4.2 (US): Students will analyze the impact of people, events, ideas, and symbols upon US history using multiple types of sources. MA 7.1.2.b: Add, subtract, multiply, and divide rational numbers (e.g., positive and negative fractions, decimals, and integers). Parachute Design: Students will design a parachute using common office and household materials. They will then test the effectiveness of their parachute at varying heights including our two-story balcony. SC.2.3.1.C Analyze data from tests of two objects designed to solve the same problem to compare the strengths and weaknesses of how each performs. Planisphere: Students will create a planisphere that they can use to map where different stars and constellations are located at different times of the day and different days of the year in the night sky. SC.5.11.3.B Support an argument that differences in the apparent brightness of the sun compared to other stars is due to their relative distances from Earth. Assessment is limited to relative distances, not sizes, of stars. Assessment does not include other factors that affect apparent brightness (such as stellar masses, age, and stage). Pocket Solar System: Students will create a to-scale solar system visual that can be rolled up and put into their pocket. Searching for Humanity: Students will learn how the Nazis, through propaganda, spread their anti-Semitic rhetoric to the people of Germany. Students will analyze Nazi posters and newspaper cartoons to identify messages the Nazis were spreading. To conclude, students will be take a guided tour of the “Searching for Humanity” exhibit. Snap Circuits 3D: Students will extend their knowledge of electrical circuits using the Snap 3D kits. Students will connect their snap connectors together to create their circuits to perform various functions. They will explore the links that bind electrical items together and discover just what makes them tick. Students will develop their own vocabulary as well as problem solving and spatial reasoning skills as they take on the added challenge of 3D construction. Snap Circuits Green: Students will extend their knowledge of electrical circuits using the Snap Circuits GREEN kits. Students will snap connectors together to design and test an adjustable fan powered by a hand crank, converting mechanical energy into electrical energy. Students will also understand the importance of mechanical energy for limiting the use of batteries and it is pollution free. SC.4.4.2.D: Apply scientific ideas to design, test, and refine a device that converts energy from one form to another. Devices should be limited to those that convert motion energy to electric energy or use stored energy to cause motion or produce light or sound. Snap Circuits Jr.: This is the perfect activity for young electrical engineers. Students will connect their snap connectors together to create their circuits to perform various functions. Students will explore the links that bind electrical items together and discover just what makes them tick and they will have to investigate faulty circuits and work together to fix them. SC.2.3.1.C: Analyze data from tests of two objects designed to solve the same problem to compare the strengths and weaknesses of how each performs. Space Habitat Design: Students will work in a group to build a workable space habitat in which they would live in if they had to move to another planet or moon. They will design the habitat’s structure and demonstrate an understanding of the concepts involved in colonizing space as well as building long-term facilities there. Space Walk: Students will learn about black holes, America’s space programs, and Nebraska’s only astronaut (Clayton Anderson), before designing their own mission patch. Sphero Basic: Sphero Basic introduces students to gyroscopic robots. Students will work control and manipulate the programming possibilities with Sphero. They will observe the force generated by Spheros moving at different speeds, and the effects of balanced and unbalanced forces generated by the gyroscope. Sphero Advanced: Sphero Code introduces students to gyroscopic robots and coding. Students will work control and manipulate the programming possibilities with Sphero. Students will complete a maze using a tablet controlled app. Spies Among Us: Students will learn about the Manhattan Project and its connection to Omaha, NE. Students will have a tour of the Martin Bomber Plant exhibit, learning how the war was won in Omaha, NE. Lastly, students will work in teams to design and build a top-secret weapon delivery system but with the constant fear that there may be a spy, or spies, in their group. Straw Rockets: Students will make their very own rockets to be launched toward a target to communicate evidence of forces in terms of the push and pull of the rocket. SC.K.1.1.A: Plan and conduct an investigation to compare the effects of different strengths or different directions of pushes and pulls on the motion of an object. SC.3.1.1.B: Make observations and/or measurements of an object's motion to provide evidence that a pattern can be used to predict future motion. Sundial: Students will construct a sundial and simulate a sun moving above it, graphing the results to see how the position of the sun affects the length of shadows. SC.5.11.3.C: Represent data in graphical displays to reveal patterns of daily changes in the length and direction of shadows, day and night, and the seasonal appearance of some stars in the night sky. Sun Wheel: Students will develop a deeper understanding of how the pattern of the Sun affects what stars are visible in the sky and the amount of natural light at different times of the day and night. Students will be able to recognize that the cause of day and night is the rotation of Earth on its axis. SC 1.11.3.A: Use observations of the sun, moon, and stars to describe patterns that can be predicted. Examples of patterns could include that the sun and moon appear to rise in one part of the sky, move across the sky, and set; and stars other than our sun are visible at night but not during the day. SC.1.11.3.B: Make observations at different times of the year to relate the amount of daylight to the time of year. Emphasis is on relative comparisons of the amount of daylight in the winter to the amount in the spring or fall. Assessment is limited to relative amounts of daylight, not quantifying the hours or time of daylight. LEGO WeDo Basic: Students will learn the basics of robotics through building a WeDo robot and then decorate their robot. Students will also learn to program their robot using the tablets to perform different functions. LEGO WeDo Advanced: Students will learn the basics of robotics through building a WeDo robot and then decorate their robot. Students will also learn to program their robot using the tablets to perform different functions. LEGO WeDo Challenge: Students will learn the basics of robotics through building a WeDo robot and then decorate their robot. Students will also learn to program their robot using the tablets to perform different functions.